Rebecca Stead won the prestigious Newbery Medal in 2010 for When You Reach Me, a book that challenges the reader to unravel a series of clues, real and metaphorical, in a dazzling but also very human story of time travel and metaphysics. 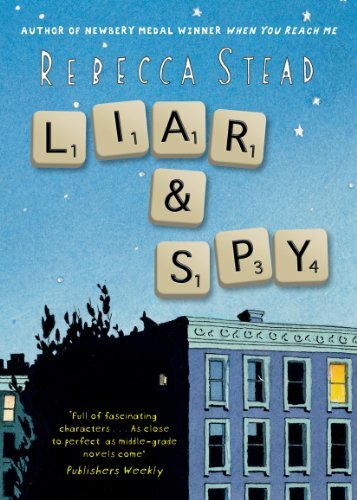 Liar and Spy is another mystery story, and once again notes and secret messages propel the plot. Georges and his parents have just moved into a new apartment in New York, downsizing after his father lost his job. His mother, who is a nurse, is always at the hospital and she and Georges communicate via notes made out of Scrabble pieces. But it’s the discovery of a note in the laundry room ‘Spy Club Meeting – TODAY!’ that starts Georges’ friendship with Safer, a boy in the apartment upstairs. The two are soon engaged in an elaborate scheme spying on their mysterious neighbour, Mister X. When Georges realises that Safer has been lying to him he feels betrayed, but, in a book that examines the stories we tell and rules we make to order our lives, no-one is telling the whole truth; Georges himself has constructed the biggest lie of all. Names take on a special importance in this book, and Georges is named after the artist Seurat: the silent ‘s’ becoming one of the things used by the school bullies to torment him. He finds comfort in the print they have on their living room wall and in his mother’s belief that bad things are just one dot in the giant Seurat painting of their lives, it’s the big picture that’s important. It takes his father to point out that the dots matter too, a revelation that inspires Georges to action. In a wonderful climax, he forms his own Blue Team of classmates and turns the tables on the bullies: team members are identified by the blue dot on their palms, a Seurat painting brought to life! Stead weaves the narrative threads together and connects the different ideas with extraordinary skill. She also succeeds in creating real characters, individuals who are much more than their worries and eccentricities. This is a richly rewarding book that will entertain and surprise, and deserves to be read many, many times.